Thomas L. Wright received his B.A. from Pomona College in 1957 and his Ph.D. from The Johns Hopkins University in 1961 in igneous petrology. Following graduation, he joined the United States Geological Survey in Washington DC. He served as a geologist on the staff of the Hawaiian Volcano Observatory from 1964 to 1969, returning as Scientist-in-Charge from June 1984 to November 1991. From 1971 to 1980 he participated in reconnaissance mapping and petrologic study of the Columbia River Basalt of the northwestern United States. In 1974, he sailed on Leg 37 of the Deep-Sea Drilling Project. In December 1993, he returned to the USGS headquarters in Reston, Virginia. Since then he has moved to the Smithsonian where he is a Research Associate in the Mineral Sciences Department, also retaining an active emeritus status with the USGS. Tom's research has included studies of alkali feldspar and the petrology of basaltic rocks. More recently, he has put time and energy into a broad historical and multidisciplinary understanding of Kilauea volcano. How did you get started in volcanology? What was it about studying volcanoes that drew you to the field? Totally by accident (serendipity is the fancy word!). I got a job with the U.S. Geological Survey right out of graduate school in an area that was not my primary interest--it involved compiling data on occurrence of trace elements for a project called "Data of Geochemistry," but it was in Washington D.C., which put me close to the petrologists that I wanted to work with. Two years or so into my work I was approached about going to Hawaii to work with the Hawaiian Volcano Observatory. I had no experience with volcanoes or volcanic rocks (I had done my Ph.D. dissertation at Mount Rainier, but on the granitic rocks that underlie the volcano) and, after consultation with my wife and colleagues, accepted the assignment. My wife was all for it, but my colleagues had mixed feelings. One person, with whom I had been working collaboratively, said "no way!, it will stifle you career, because you can't keep equipment working due to power outages" (what's new?, anywhere in the country). The other said "Go, Tom. You've been working with white rocks (granite) and these have had their day. Hawaii is black rock (basalt) and that's where the future is." So I went and it was a career-defining experience. That "black rock". 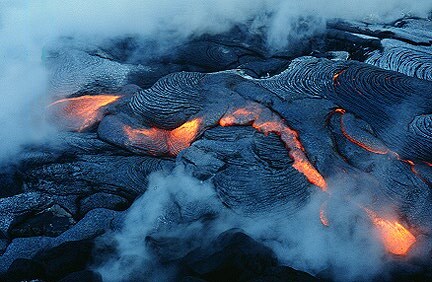 Basalt lava flow from Kilauea Volcano.Photograph by Steve Mattox, July 1990. What would you rate as the best experience you've had while working on a volcano? Hard to pick the best. I spent much of my first tour in Hawaii as a geologist drilling a pond of lava erupted into a pit crater (Imagine a giant outdoor experiment in which the crucible is the crater and the filling is liquid basalt.) Our finest day was when we successfully measured the viscosity (stickiness) of the molten lava under a 50-foot thick crust. The probe, developed by a friend and colleague, was a rotational viscometer, attached to the end of a stainless steel casing, and pushed into the lava at the bottom of the drill hole after it softened following the drilling (water was used to cool the drill bit so it could penetrate into the hot zone). Our first excitement came after successful emplacement of the probe when it started rotating, powered by weights at the top of the drill string. We measured the speed of rotation to calculate the viscosity. The final excitement occurred when we successfully recovered the entire probe, complete with a quenched sample of molten lava adhering to the viscometer. This took several hours of corkscrewing the drill string out of the hole. Drilling steel loses its strength at the temperatures of molten lava and bends to touch the sides of the hole. Meanwhile, the molten lava adhering to the viscometer froze as we pulled it up, thus making the recovery more difficult. During the Kalapana crisis of 1989-1990, after I had returned as Scientist-in-Charge of the volcano observatory, I realized that many of the technical staff had not had a chance to see active lava. So I took them individually as partners in the monitoring of the lava advance on populated areas. During the monitoring we had to cross areas of active lava, a hazard that could only be learned through experience. One person accompanying me was never able to cross even a short stretch of hot lava without having to take off his boots on the other side, because of the heat. I was wearing normal geologist's field boots and had no problem. It turned out that my colleague had steel-reinforced boots, the sort used on construction sites, and the steel pins brought the heat of the lava directly to the soles of his feet! I was terrified by my first view of a volcanic eruption in Hawaii. The eruption (the one whose lava lake I later worked on) was several hundred feet down in a pit crater, and some geologists experienced in working with active lava were going out on the thin crust at the edge of the rising lava lake. I had to force myself to go down to join them thinking at the time that I was in the wrong place and should retreat to a different area of the USGS. Once I got down on the talus at the level of the rising lava, I was still apprehensive until I had an opportunity to collect my first sample of molten lava on a ceramic tube, holding a heat shield in front of me. That was an amazing experience. The molten lava was the consistency of taffy and I was excited to see the fresh, glassy sample on the tube. After that, my fear of the volcano was replaced by excitement, although I never became complacent, always aware that I would have to be prepared to react to something unexpected. It combines field and office work (computer, library, etc.). Geology/Volcanology is still largely a qualitative science, so one can deal in the realm of ideas-inductive reasoning. It can also be quantitative-much of my work has been interpreting the very precise chemical analyses of rocks to infer important things about what chemical changes can happen during magma storage and transport. Finally, I love the aspects of volcanology that mean something to people-hazard evaluation for populated areas at risk-including actual monitoring of lava flow advance-and the educational projects I've recently been involved as a technical consultant to a developer of a middle school curriculum on natural hazards, and for a children's book on volcanoes and earthquakes. What's the most difficult thing about being a volcanologist? Nothing occurs to me. Like any profession, it's a challenge to do ones job at a high level, but I don't count that as difficult.